Binary compounds – chemical substances made from just two chemical elements – are individually structurally simple, yet taken together the materials possess & exhibit a rich set of behaviours. The logical structure & reactivity arguments put forward in the Chemogenesis web book employ binary compounds as examples wherever possible. Dictionary and web definition of a binary is: "A chemical compound composed of only two elements", here, here & here. Binary compounds are materials/substances that exhibit only one type of strong chemical bond: metallic, ionic or covalent. We are interested in the sub-set of binary compounds that are: mono bond typed. But only methylene, CH2, and methane, CH4, possess only one type of strong chemical bond and are the only substances to be considered binaries, here. Water, H–O–H, only has hydrogen-to-oxygen bonds, whereas hydrogen peroxide, H–O–O–H, has hydrogen-to-oxygen and oxygen-to-oxygen bonds. Likewise, NO and NO2 are mono bond type binaries, whereas N2O3, N2O4 (the dimer of NO2) and N2O5 are not. The chemical elements as material substances are here – within the Chemogenesis web book – considered to be special case binaries where the two elements are identical: H2, O2, N2, etc. This definition also holds with bulk elemental materials: lithium, Li, carbon (diamond), C, carbon (graphite), C, silicon, Si, etc... that exist as extended lattice structures rather than forming discrete molecules. From the Wikipedia: "Allotropy, or allotropism, is the property of some chemical elements to be able to take two or more different structural forms that exhibit quite different physical properties and chemical behaviours." Carbon can exist as: graphite, the thermodynamically stable form of carbon under standard conditions (25°C, 1.0 atm), diamond, fullerenes including: C60 buckyballs, SWCN (single walled carbon nanotubes), and many others. Oxygen can exist as dioxygen, O2, (a diradical which can exist in distinct singlet and triplet forms) and ozone, O3. Allotropes of: carbon, phosphorus, oxygen, nitrogen, sulfur, selenium, boron, silicon, arsenic, antimony, polonium, tin, iron, titanium, strontium, plutonium, ytterbium, terbium, promethium, curium, americium, berkelium and californium are discussed on the Wikipedia page. From the Wikipedia: "Polymorphism is the ability of a solid material to exist in more than one form or crystal structure. Polymorphism can potentially be found in any crystalline material including polymers, minerals, and metals, and is related to allotropy, which refers to elemental solids. Together with polymorphism the complete morphology of a material is described by other variables such as crystal habit, amorphous fraction or crystallographic defects. Silica, SiO2, has many polymorphs, including: α-quartz & β-quartz, tridymite, cristobalite, coesite, stishovite and silica gel. The chemistry of a solid substance can be strongly influenced by the particle size. Magnesium oxide, MgO, is a refractory (heat resistant) material that is used to form the fire bricks that line furnaces and kilns. The chemistry of a sample of MgO consisting of a fine power will be rather different to the chemistry of a solid block of fire brick. Colloidal gold, wikipedia, or nanogold, is a suspension of sub-micrometre-sized particles of gold in a water. The liquid is usually either an intense red colour (for particles less than 100 nm), or a dirty yellowish colour (for larger particles). The idea of chemical substance, of physical chemical stuff, holds a special place in chemistry. OK, I can imagine a reader thinking: "What is the author going on about now? Is this of any importance???" Abstract water is the idea of water. Abstract water is imagined water. Abstract water is transcendental. Abstract water has no properties unless they are explicitly assigned. Abstract water consists of H2O molecules and it has a reactivity profile, for example abstract water is formed by reacting abstract hydrogen, H2, with abstract oxygen, O2. Real water is water the material substance. Real water is a liquid and it is wet. Real water has a literature melting point and boiling point, 0°C and 100°C at 1.00 atm pressure. Real water can never be completely free from impurities. Real water has hydrogen and oxygen isotopes, 2H and 17O, and very small quantities of the radioactive isotopes 3H and 18O. Real water is assumed to be a homogeneous single phase. Thirdly, there is the specific water. This is the water as understood by the analytical chemist where every sample is unique. Consider the analytical lab attached to a municipal water works, a supplier of bottled water or the steam generation plant of a power station. Samples of water will be collected every hour (or whatever) and will be given a unique sample ID. Numbered samples will be tested optically for clarity and colour, inorganics will be tested for by AA or ICP and organics will be determined by GCMS. There will be analytically limits, and only if the specific sample passes the various analytical tests will the batch (with a batch number) of water be passed for use. The problem is that teachers of chemistry and authors of chemistry textbooks, this author included, tend to talk about chemical substances in different ways in different situations. When a lecturer/teacher/author writes: 2Na + 2H2O 2NaOH + H2, they are considering water in a very general and abstract sense. We are being asked to imagine the process. It is not stated if solid, liquid or gaseous water is used. There is no glassware, no reagents. Just the notion of sodium, the notion of water, the notion of sodium hydroxide and the notion of hydrogen... these are idealised chemical entities, not real substances. When the real 2Na + 2H2O 2NaOH + H2 reaction is carried out in the laboratory the whole experience is very different. The reaction is spectacular & dangerous: full safety precautions should be taken. The real water is a liquid, it is wet and it gets everywhere. An chemistry class may sample a local river every six hours and analyse the specific samples using atomic absorption spectroscopy, AAS. To get meaningful results all reagents must be of the highest (and known) purity. It is assumed, almost certainly correctly, that the river various samples will be quantifiably different because rivers are continuously changing, dynamic systems. Crucial to the abstract-real-specific substance logic is whether the stuff in question is homogeneous or heterogeneous– whether it is a single phase or has phase boundaries. Chemists love their chemical stuff to be homogeneous: be it pure substance or a homogeneous mixture (solution). Solids are dissolved, solutions are filtered & stirred in an effort to ensure homogeneity. Abstract substance occupies a universe of infinite scale and so is phase independent by default, unless phase is explicitly introduced. When discussing Henry's law or Raoult's law the liquid-vapour interphase is assumed to be the infinite surface of a boundless ocean. Real substance has phase and phase boundaries by inspection. 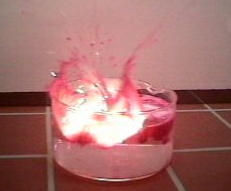 500ml of liquid in a flask consists of the liquid phase plus liquid-air, liquid-glass and glass-air phase boundaries. In a given situation it may be possible to discount the phase boundaries, for example it is usually possible to ignore the evaporation of water during a titration. Specific substance is assumed to be homogeneous within a batch (within analytical limits), but is assumed to be heterogeneous between batches, but to still be within limits. This is actually true of any [non-bespoke] commercial product. There is a discussion about phase boundaries elsewhere in this Chemogenesis web book. Consider diamond, the well known allotrope of carbon. Abstract diamond is a network covalent material consisting of an extended lattice of covalently bonded carbon atoms. Abstract diamond is hard and has a high melting point. Abstract diamond is colourless and it has a reactivity profile: abstract diamond burns in oxygen to give carbon dioxide. Abstract diamond is the notion of diamond, it is the idealised or transcendental substance. Real diamond can either be a natural mineral or it may be synthetic, produced in a lab or industrially. Real diamonds (natural or synthetic) may not be be completely colourless, they may have a blue, pink or yellow colour tint. Real diamonds contain 1.1% carbon-13 (13C), they have a refractive index 2.4175–2.4178, a specific gravity 3.52 (+/- .01) and a Mohs hardness of 10. There are many specific diamonds, indeed there is a Wikipedia page listing famous diamonds. These diamonds have individual: weights, cuts, colours, inclusions, settings and even names. So the abstract diamond, the allotrope of carbon, notion of diamond is rather different to the notion of real diamond, the synthetic grit used for hardening machine parts or a bag of small colour and sized matched gem stones used by jewelers, and this is rather different to the large specific diamonds, of extraordinary value with individual names. As discussed elsewhere in this web book, chemists may attempt the synthesis of a chemical that cannot be made in principle. Such a synthetic target can only be abstract. It is thought hydrogen forms a metallic phase at high pressure, but until proved conclusively the notion of metallic hydrogen is abstract. I quickly learned while doing my Ph.D. in organic chemistry that the problem was the practical nature of my chosen research project. If I decided to use lithium aluminium hydride, for example, I would think about abstract, idealised LiAlH4 and add it to my idealised reaction flask. Easy as! The reality would not be so simple. The procedure would be dominated by the fact that lithium aluminium hydride is a low density dust that can be spontaneously inflammable in air and is rapidly destroyed by moisture. I visualise LiAlH4-the-abstract-substance... but in the lab I am confronted with LiAlH4 the-real-substance. We teach students how to do titration calculations in class, but in the lab they are confronted with glassware, running taps and water getting everywhere! Students find it difficult to see how lecture/classroom teaching has anything to do with lab work. Question: If a proposed reaction fails in the research lab, is it because the reaction scheme is flawed or because the experiment was poorly executed? Is the abstract chemistry wrong or is the real chemistry wrong????? The issue occurs with the design of The Chemical Thesaurus Reaction Chemistry Database. When I first started to develop this project I naively assumed that there would be one entry per chemical, but this soon proved impossible. The useful chemical reagent borane, BH3, actually does not exist under usual lab conditions. Chemists use diborane, B2H6, or borane complexed with tetrahydrofuran, BH3:THF in THF, that act as proxies for borane. They react chemically as if they were BH3. Carbon is a particular problem in the Chemical Thesaurus reaction chemistry database. What exactly do I mean by carbon? Do I mean: Graphite, the thermodynamically stable form of the element at 25°C 1.0 atm., Coke, the carbon material added to blast furnaces at a rate of millions of tonnes per year, or Carbon-the-Basic-Elemental-Substance as discussed here: The Periodic Table, What is it Showing? Consider the substance morphine. Does this refer to: morphine in opium, morphine free base, morphine sulfate, a 5mL amplue of injectable drug in saline, the structure of morphine drawn on a page, an in silico computer model of morphine, or what? Check out Aldrich or any of the major chemical catalogs and see that there are multiple entries for all of the common chemical substances. In large part getting to grips with chemistry involves understanding that the idealised, abstract, essential, transcendental chemical entities we hear about in class and read about in books – including this web book – are actually complicated, difficult to use*, real, material, substances in the laboratory.